Bespoke Dance and Functions are a leading events company covering the UK and Ireland, looking for new Belfast based tutors. This is for the occasional beginner level hen party dance class. 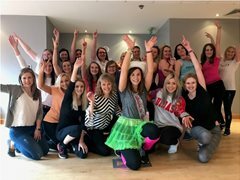 These are themed classes such as single ladies, abba, 80s and more. The classes are central Belfast and pay is £50 per 90 minutes class. We supply the music and choreo for these if required. No teaching experience needed although preferred and full training can be given.